Every year a number of relievers come, seemingly, out of no where to save a tons of games or post tiny ERAs. This year’s prime example is David Aardsma. He has kicked around for a couple of years throwing a really hard fastball, striking out a fair number of guys, but walking to many. This year he has all but given up throwing anything but his fastball, and is getting even more strikeouts with, slightly, fewer walks. 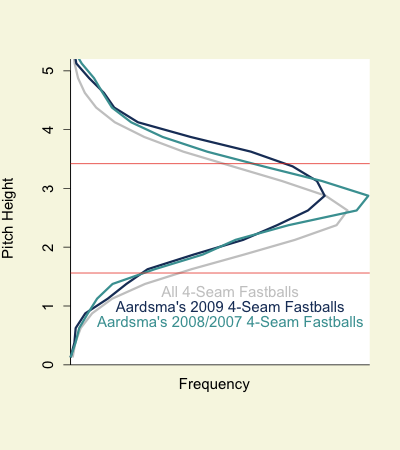 Aardsma throws his fastball 87% of the time (and 92% of the time to lefties). Even so it is a wildly successful pitch, saving more runs than any reliever’s fastball and more than all but ten starters’. It is the archetype four-seam fastball, very fast and lots of ‘rise’. With four-seam fastballs there is a general relationship in which the higher in the zone pitch is the greater the whiff rate (the probability the batter misses if he swings) and the lower the ground ball rate. So a pitcher who throws his fastball up in the zone will, generally, have more whiffs, and thus strikeouts, and fewer grounders. Vice versa for a pitcher who throws his fastballs down in the zone. Aardsma is firmly on the whiff-side of this tradeoff, and even more so this year. As a result he has a tiny 23% GB rate, but his fastball has one of the highest whiff rates in the game and he strikes out a ton of batters with just the fastball. An even bigger change has been has been the horizontal location of his fastball. 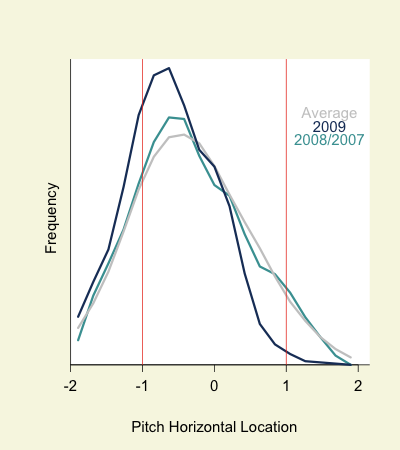 Here is a histogram of the horizontal location of his fastball to LHBs in 2009, in 2007 and 2008 and for the league average four-seam fastball to left-handed batters. Zero is the center of the plate, with -1 and 1 the horizontal edges of the strike zone. LHBs stand to the right of the plate in the positive numbers. He was surprisingly close to average before this year, but now is much better at locating the pitch on the outer half, and even the outer fourth of the place. He is in the zone more and never misses inside. This cuts down on his walks and keeps the ball away, where most hitters have less power. Aardsma fully embraces the ‘throw a very hard fastball up in the zone and hope the batter swings and misses’ ethos. This year he has embraced it further, throwing more fastballs higher up in the zone, and also seems to have better horizontal command. It has worked out well for him and for the Mariners. We hoped you liked reading The High Heat from Aardsma by Dave Allen! Great article, but I have one minor disagreement at the end. Lefties usually love the ball LOW and in, not up and in, so I think not throwing inside at all will eventually hurt him. He can keep the HR’s down throwing away, but slap hitters love the ball up and away, and most other hitters can make an adjustment to go to left field. agreed, up and in is usually a lefty power hitter’s hole. Good point guys. I changed that in the post.